Basically dying today. Well a little bit. 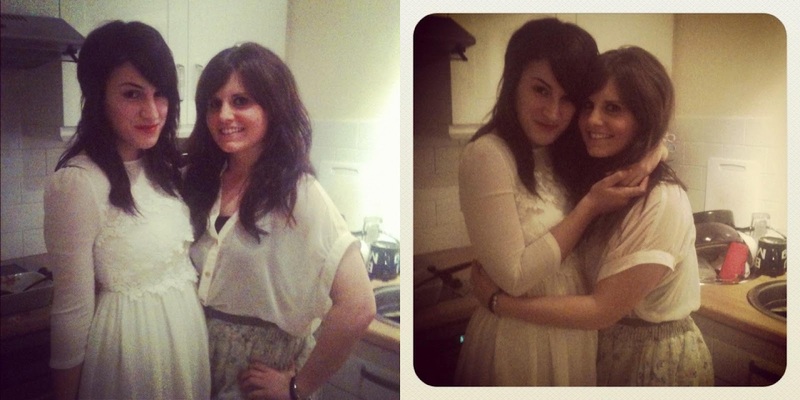 When little Laura rocked up last night, we raced to get our gladrags on and drown our sorrows in vodka. And we certainly did just that. For once in my life, I chose to wear the first thing that I tried on! Now this dress is what I had wanted for many moons, telling myself it was heavenly for Mama's party. I debated wearing it, then telling myself to save it. But last night I thought I'd give it a test run, and see if I could still pull my chicken dance moves. THANKFULLY I could. SO this is still a contender for the party! I'm also going to buy this black dress and decide on the night which one I'm feeling. It's going to be tricky. I want black for elegant, simple and flattering, PLUS I can eat lots. BUT the white is so feminine and beautiful, yet requires starvation! Oh sigh. Life is hard. And with life being hard, some friends came over and we all got wasted. We danced a lot, and ate some chips and cheese, and laughed way more than intended at Laura's fail of a shoe. Seriously, should have been there! Spot the difference? No, me neither. We've spent today watching stupid Youtube videos (seriously the best ever! ), eating a fry up for 6 and discussing the idea of possibly marrying each other. She also taught me some ballet. Living the high life really. Tomorrow I am going to begin packing up the millions of things we have acquired since being in our abode. Well, I say this but it really means i'll stare at the empty boxes, move them in to the relevent room, and then hope it fills up all by itself. I should really be an expert at packing after 4 years of moving around. Sigh. Pass me the chocolate instead. PeeEss. Lots of sighs in today's post. I blame the hangover? Maybe? And I already miss the little wild cat that is Laura! Do us a favour, and follow the clueless social networker.. She's a babe.